If you want to gather more powerful backlinks for your site, here are a few tips to help you craft a tactfully sound email outreach campaign. 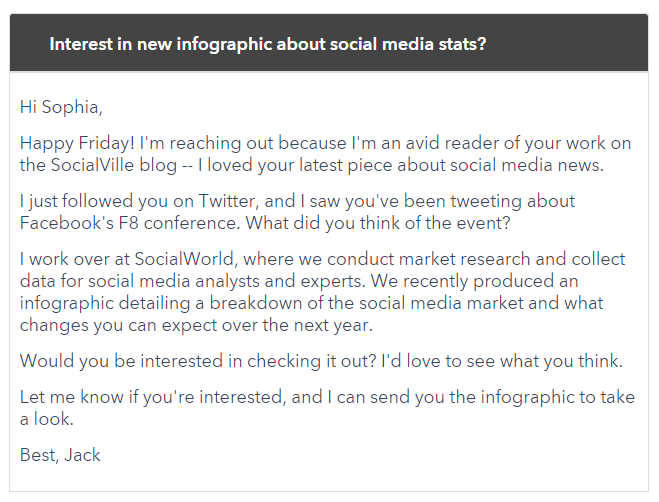 Templates can be tempting — especially if you have to reach out to dozens of people. But believe us, it rarely works. In today’s age where almost everyone is so internet savvy, publishers can smell templates from a mile away. You won’t be able to get any backlink with a template, but you will lose credibility and the opportunity to make a lasting first impression. Instead, carefully research about your email recipients and create personalized emails that speak to only them. HubSpot’s example of a personalized email is spot on. Here, take a look. People care about their recent articles the most. If you can reach out to them within the first 24 hours of them publishing a blog post, you may have a higher chance of scoring a backlink. You can keep a close eye on your push notifications and RSS feed to see if your favorite blogs and publications have published any new piece of content. You can also use a paid tool like Pitchbox that curates a list of websites that published something during the last 24-hour period. You can also use BuzzSumo to search for any content that is published within the last 24 hours. An important aspect of successful email outreach is to stand apart from the hundreds of emails that the other person would potentially be receiving. One excellent way of doing that is to lay a foundation, and the best channel for doing that is social media. Follow the other person on Facebook or Twitter and get the conversation going. First, get yourself noticed. Then you can reach out to them via email — or even on the same social channel — and you will have something to talk about and a foundation to build your working relationship on. Social proof is great, and every marketer should leverage it as much as possible. Do you have any reputable clients? How many email subscribers do you have? Do you have any high-quality backlinks from recognizable websites? These are all “social proofs” that you are not a nobody. Once you show a person that other bloggers are already linking to your content, they’d also be more likely to create a link to it. With social proof comes perceived value, and sometimes that’s all it takes to get your foot in the door. Seriously. Do your research. Lots of it. This is another reason why you shouldn’t be spamming dozens of publications — because good research takes time. First, make sure that you are emailing the right person. You’d be surprised how many people don’t pay much attention to it and kill their link-building chances right away. Second, if you mention that you “enjoy their blog posts on a certain topic”, make sure that they have written plenty about it. It won’t work if they have just written one or two posts on a topic and moved on. In short, mention what you think their interest is — not something that they may have worked on a couple of times for some reason. Third, try to mention one of their recent posts. While there’s nothing wrong with praising an older post, recent posts may have a bigger impact on the writer as those would be still fresh in their mind. Whether you are reaching out for pitching a guest post or just asking for a backlink, a well-crafted outreach email is the key. Use the tips mentioned in this article to make sure you are doing it right.